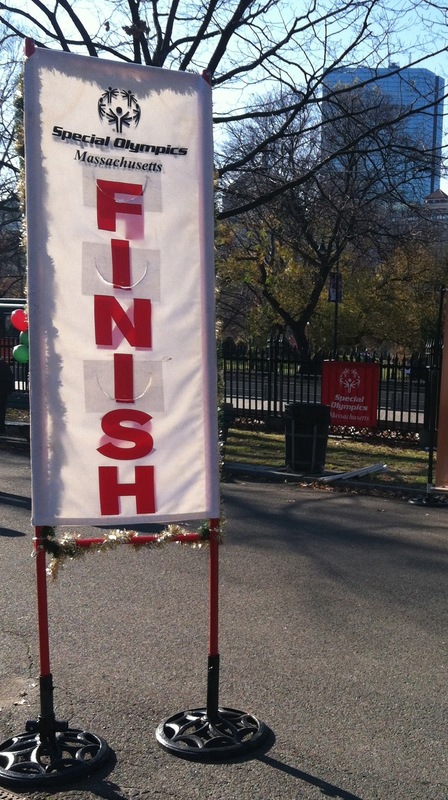 The finish line on Boston Common from December's Jolly Jaunt 5K. Just coz. I hadn’t played this Record of Shame before, so each track was a fun surprise, which I am sure inspired me to keep going, and go faster. It made me think about music and its relationship to running. Expert types say the best tunes to play on the run are those whose beats per minute (BPM) match your mile pace. To test the theory in my world, I decided to put together a quick BPM-savvy list based on a small portion of my iTunes library. According to jogfm.com, my ideal BPM is 135-150 (based on a 10-11ish pace). Using that website, plus a combination of the free BPM analyzer from MixMeister (crashes a lot and can’t handle large volumes, but hey, it’s free) and an app called Easy 5K With Jeff Galloway, which has a function that analyzes songs (more on the app in another post), I came up with a bunch of tracks that are allegedly the ideal tempo for my pace but for the most part are not songs I would have necessarily chosen to run to. What I've been running to. Yes, heavy on the Kylie. But the big question is: Should I care about the science, or should I just run to what I like? Below is the fancy new list. I’m going to try running with these tracks over the next few races to see whether they (a) drive me to go faster or (b) just make me pine for my old song-selection methods. I’ll report back on my, er, findings. This entry was posted in Fitness, Running, Sports and tagged BPM, music, playlists, tempo. Bookmark the permalink. OMG!! Love this post. One of the many things I love about running is making new playlists. I feel it’s the only time I get to actually relax and listen to music I like (instead of whatever my kids want in the car). Can’t wait to hear about your findings. Fascinating! I need to try this! Thanks for sharing! Tracey, try the Black Eyed Peas. Always works for me when trying to exercise. Let me know how you go. Good luck! If I find music that is not only at the right pace but, uplifting or fuels my determination then, I can go for ages. Without music, I’m like a sack of potatoes being rolled up a staircase… Just not possible. Ooh, I love that song from the Run Lola Run soundtrack – its one of my favourite films. I like electronic music while at the gym. However I’m not consistent in having music with me. Sometimes I have music I can sing to, but I try to remember to just mouth the words. I don’t think people at the gym will appreciate my singing! Haha! I know I definitely mouth the words sometimes while I’m running a race, but I think it’s mostly to distract me from the pain. I’m sure I’ve let a few lines escape now and again, although I don’t want to think about what that sounds like! I can’t run without music though. If I arrived at a run or the gym without my headphones, I think I’d have to call it a day! RIO! Duran Duran? Hahhaha! Awesome! You ARE my new hero…it’s official. Keep goin’ girl!! Ha. What can I say, I’m an ’80s girl!!! Rio is especially fabulous though, as I discovered on the weekend! It definitely is up there with my favorite running songs of the moment. More on that soon! great experiment. i believe strongly music plays a crazy role in running. i have very random pairings…and sometimes i sing out loud just to keep me motivated. i’ve got Marilyn Manson, 9 inch nails, Beyonce, One Republic, Pink and Aerosmith on the same playlist–good luck figuring out whether the science ways in. Thanks!! And, oooh, good suggestions. I have some NIN. I’ll have to add it to the list! I’d like to analyze my whole library, but it takes sooo long. There’s a program called Tangerine that does the whole thing, but I have heard reports that it’s really inaccurate. When I put in my pace, the website laughed at me – is that supposed to happen? Just kidding! I wrote down songs I already have for 12:00 and 13:00 minute mile paces. I am going to create some playlists and see what happens – it can’t be any worse than listening alphabetically and might even help. Thanks for the hint! Aww, Elton John. Fist bump. When I started running, my Now That’s What I Call Music, 40 was Cher’s Greatest Hits. Now I just watch “Ellen” at the gym. She had Shemar Moore on her show today. He took off his shirt. Exhilarating. Also, try Queen. Freddie’s got the beat. Ooh, Queen. Good idea. I have their greatest hits. Haha, I love that you ran to Cher.